Wichita's civil rights ordinance has never been restored. Avid readers of this column know that today, you can be fired from your job for being a homo on the range. Many are not aware of a legendary window of time where such was not the case, though. Once upon a time in a land not at all far away, it was illegal to discriminate on the bases of “sexual preference” in housing, employment, and public accommodations in Wichita—for a whopping seven month! The ICT had a very progressive, forward thinking city commission (now referred to as the city council) in the late 1970’s. 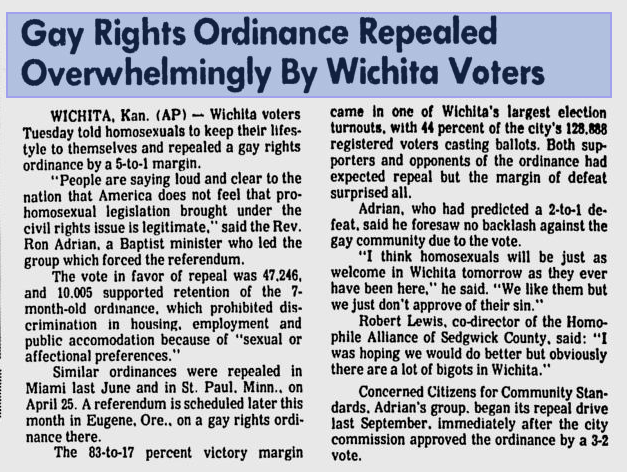 In the fall of 1977, Wichita became one of the first cities in the country to enact a non-discrimination ordinance that covered gays, lesbians, and bisexuals. The passage of the law was no accident. Wichita had an engaged and politically savvy LGBT faction that was an active, visible part of the community at-large. They knew how to organize and make things happen. They supported candidates in elections, and they educated lawmakers in office. At the same time Harvey Milk was campaigning to become one of the nation’s first openly gay elected officials by the bay, gay Wichitans were staging a little revolution of their own on the prairie. When the ordinance was originally passed, many began talking openly about Wichita becoming the San Francisco of the Midwest. That didn’t sit well with everyone, though. Several churches were quick to organize a repeal effort, and within just a few months of the law passing, it was headed to the ballot box. Anita Bryant, apparently tired of sipping orange juice, came to Wichita to crusade for the repeal. The campaign was short, but nasty and personal. On April 9, 1978, all incumbents who voted for the law were defeated, and the ordinance was overturned by a margin of 83%-17%. Of the 57,251 people who showed up to vote, only 10,005 voted to allow gay people to have the same rights as everyone else. San Francisco, we did not become! Many people publically identified with backing the law were blacklisted. Several were fired from their jobs or evicted from their apartments. A good number of gay people moved away. Most who stayed either went back into the closet or marginalized themselves. As gays become more visible and involved in other communities across the country, the rainbow faded in Wichita. Thirty-two years later, the laws haven’t changed, but Wichita has progressed. There have never been more gay people active and visible in all parts of this community as there are today. They’re not just crusading for gay rights, either—they’re opening businesses, revitalizing neighborhoods, and enriching their places of worship. Yet, the sting of Wichita’s “legendary” anti-gay past is still felt. Those who are out, though, are paving the way to a day when a law outlawing discrimination of the basis of sexual orientation (and now gender identity) lasts for more than seven months!